All-star games and travel team trips define summer for so many of our kids. Families load up the SUVs, fill the car full of snacks and hit the road to stay in hotels with teammates running the halls. The insanity can be fun, but it can also be overwhelming, with so many kids to keep tabs on. The trick is keeping calm and staying prepared. Here are three no-fail scenarios to be prepared for when you’re on the road and off the field this summer. Things to consider . . . is your child a strong, independent swimmer? Will there be an adult chaperoning? Make sure you lay down some ground rules like no wrestling or diving, don’t disrupt other swimmers in the pool and put some time constraints around how long he/she can be at the pool. If all else fails, go with them and volunteer to chaperone for 45 minutes. Your child will be delighted, and the other parents will thank you. Your initial thoughts: how far is the hotel? Has Bobby’s parents had a beer or two at dinner? Do you trust Bobby’s parents? There are very clear reasons to say no, however an alternative is to invite Bobby to ride back with you and let your son or daughter control the music playlist on the way back. Roll down the windows and rock it out on the way back to the hotel. Must-ask questions include: what room number is Sam in? Are his parents in there? Who else is in there? Then, verify. Talk to Sam’s parents and find out if it’s OK. Evaluate the situation before allowing them to run off. Express the importance of not disrupting other hotel guests and not to go anywhere else without coming and asking you first. And don’t forget to review the good ‘ol stranger danger rules. No matter what the scenario, let technology help you. You’re kids aren’t going anywhere without their devices, and you can use that to your advantage. Apps like TeamSnap and MamaBear help you keep tabs on the kids while letting them flex their independence simultaneously. For example, the MamaBear app has a family map to share location, you can receive driving speed notifications and get clued in to social media activity. With TeamSnap Live!, everyone on the travel trip can use the Locker Room to communicate instantly to find out where the after-game dinner is, who’s chaperoning the pool or what room the late-night gathering is in. And for actual game time, Live! can be used to provide real-time game updates for those who couldn’t make the trip. 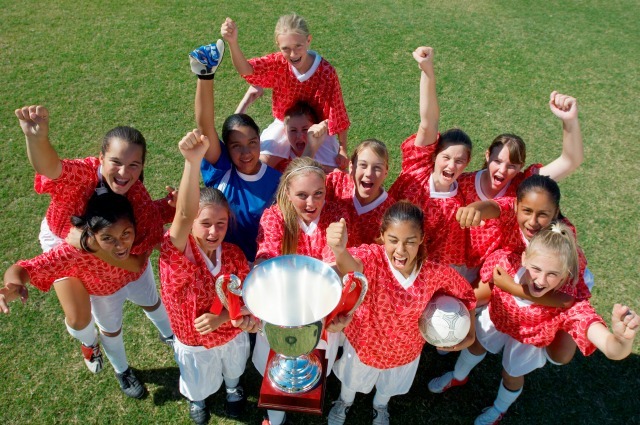 Find as many opportunities as you can to say yes this summer and give your child independence and social time with their teammates with safety in mind. It can make them a stronger team and offer social lessons without you peering over their shoulder. And remember, you have the power of technology at your fingertips with your phone to stay connected and monitor activity proactively while offering your child desired independence. MamaBear is offering a free premium upgrade through the rest of the summer to TeamSnap customers. Register here and use promo code TeamSnap_WorryFree15.